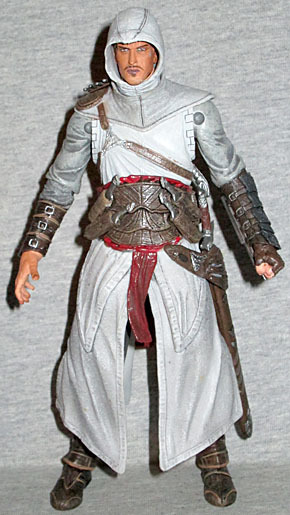 I knew nothing about the video game Assassin's Creed before picking up NECA's Altair figure. As part of their Player Select line, I knew he was a character in a video game, and that's pretty much the extent of it. The Third Crusade is tearing the Holy Land apart. You are an elite Assassin sent to stop the hostilities by suppressing the powers on both the Crusader and Saracen sides. But as you carry out your missions, a conspiracy begins to unfold. You find yourself tangled up in a conflict that threatens not only the Holy Land, but the entire world. The packaging blurb mentions something about him being an assassin during the Crusades who slowly gets drawn into a big conspiracy, or something. A perusal of the Wikipedia entry on the subject reveals more. Probably pretty meaty stuff if you're into it, but Altair is one of those rare figures I bought solely because of how cool he looked. The sculpt, as handled by Craig Campbell and Jason Frailey, is full of tiny details and seems to match the game design of the character very well. He's got straps and pouches here and there, but not in a haphazard, Jim Lee sort of way. There are very nice small touches, like the tiny throwing knives on his right shoulder blade and left calf, as well as the tiny vials of mystery liquid on the back of his belt. He's sporting a robe of vaguely medieval design, and though his head is mostly covered by a hood, the hood itself is a separate piece of material, and you can tell he's got hair, ears, and probably a full head sculpted under there. Alas, the hood is too tight a fit to be removable, but still, nice job sculpting a whole head, guys. The hood doesn't rest quite as symmetrically as it does in promo shots, but it still fits better than most action figure hoods. The different materials of his outfit are sculpted with different textures, but none of it is overdone. His face has a stern but neutral expression, with a very subtle hint of a scar running across his lips. It's all handled very well. Interestingly, he's missing a finger on his left hand. It's supposed to be that way though; such is the mark of an Assassin. The paintwork, credited to John Wardell and Geoffrey Trapp, isn't quite as stellar as the sculpt, but it's still decent. 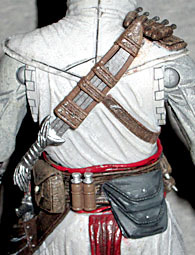 There's a grey wash on his white robes, and while most of it is quite nice, it gets a tad overdone around the collar. Some of the straps on his chest are quite sloppy around the edges, and the paint on the skin of his left hand is goopy and terrible. That said, most of the small details are done very nicely, and there's a lot of good work here. As with NECA's Lara Croft figure, inconsistency is the order of the day, though the overall paint job is solid. With the Player Select line, NECA has been experimenting with expanding their articulation, and it's a trend that fortunately seems to be flowing into other lines, like their upcoming Castlevania and Aliens vs. Predator: Requiem figures. The Player Select Kratos (from God of War) and Kain (from the Soul Reaver games) figures both had some nice hinged joints where you wouldn't normally find them on a NECA figure, and Altair takes the trend one step further. All told, he's got 14 balljoints: his neck, shoulders, elbows, wrists, waist, hips, knees and ankles. While he's no Marvel Legend (or Legendary Comic Book Hero, if you're a ToyBiz fanboy), he still has a very nice range of motion in most of his joints. His elbows can almost make a 90° bend, and his neck is surprisingly unrestricted by the hood. His hips don't fare as well, hidden as they are under his stiff robe. Still kudos to NECA for realizing what a shadow of its former self McFarlane has become, and finally making a serious move in the opposite direction. With this figure NECA shows that you can indeed have a well-articulated figure that still preserves the figure's sculpt entirely. In addition his cool design and nice articulation, the accessories also really drew me to this figure. Almost all of the armaments on his person can be removed, including a large sword that fits in a sheath on his left hip, a medium-sized dagger that slips into a sheath on his back, and four tiny throwing knives that can be stored about his girdle. There's also a retractable blade attached to his left forearm, which is very cool. An open, interchangeable right hand is also included, and you can pretty easily slip the tiny daggers between the fingers. So class, what do you get when you combine a great design and sculpt with some solid articulation and a very nice compliment of accessories? A very, very nice figure. 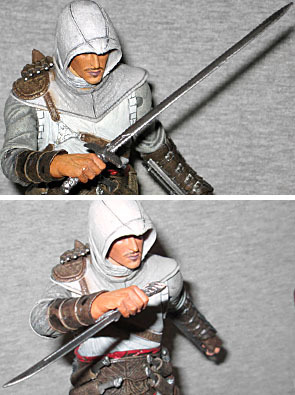 You don't have to know a flipping thing about Assassin's Creed to enjoy NECA's Altair figure to the fullest. There is nothing bad to say about this figure; the paint isn't quite as stellar as the other aspects of the figure, but it stands up to any other product on the shelves today. Seek him out, you won't be disappointed.